Hulu with Live TV Channel List - What Channels are on Hulu TV? Hulu with Live TV Channel List – What Channels are on Hulu TV? What Hulu’s subscription plans offer. What add-on services and premium channels you can get. What the Hulu TV channel list looks like. Which subscription plans are best for you. What’s on the Hulu Channel List? Hulu with Live TV is a subscription service that turns Hulu into a complete replacement for a cable subscription. With support from all of the major networks, Hulu offers one of the more complete solutions for cord-cutters. Like other services, Hulu lets you rewind, pause and fast-forward programs as well as record programs to its cloud DVR. Hulu’s Live TV service is available on every major device platform with the exception of Sony’s PlayStation. Related: YouTube TV vs. Hulu TV – Which is the Best Live TV Streaming Service? Hulu offers two options for watching its Live TV service: a Limited Commercial plan and a No Commercials plan. Unfortunately, the names of these plans are misleading since they don’t apply to live TV. Subscribers to the Limited Commercial plan pay $40-per-month to watch live TV and ad-supported on-demand TV shows. When streaming an on-demand episode, these subscribers must sit through four or five commercial breaks in a typical one-hour TV show. Each break lasts anywhere from thirty to ninety seconds and can’t be skipped or fast-forwarded. The No Commercials plan costs $44-per-month and it does what it says on the label: allow you to watch commercial free on-demand videos. Unfortunately, there’s no way to turn off advertising on the live streams. Whatever commercials you would see on cable, you will also see on Hulu. For an extra $15-per-month you can expand the cloud DVR service to two hundred hours of recording time from the standard fifty hours. This extra also unlocks the ability to fast-forward through commercials when playing recorded content from the cloud DVR. Another $15-per-month add-on lets you stream to as many devices as you want throughout your home and to as many as three mobile devices at the same time. You can combine the two add-ons for a single $20-per-month subscription. Regardless of the plan, Hulu offers premium add-on subscriptions to HBO, Starz, Showtime and Cinemax. Hulu with Live TV subscribers can’t record Game of Thrones or other programs on these channels, but each episode appears as an on-demand option after it airs. Hulu offers more than fifty channels of live-streaming content from many of the most popular networks you would find on cable. Hulu’s original programming is one of the service’s biggest features. The latest episodes of award-winning shows like The Handmaid’s Tale and fan favorites like The Mindy Project don’t appear anywhere else. Hulu has tried very hard to work out deals with local ABC, CBS, Fox, NBC, myNetwork TV and Telemundo stations. However, whether you can get them in your particular TV market depends on where you live. The web of licensing deals between the networks, Hulu and the station owners is complicated. NBC itself only owns a dozen local stations, so Hulu has to negotiate separate deals with the other two hundred affiliates. Houstonians, for example, can get local streams from the four major networks plus myNetwork TV and Telemundo. Those living in Ames, Iowa, only get local CBS and Telemundo stations. Options are limited even in Portland, Oregon, where people only get the local Fox and Telemundo stations. You can check the status of Hulu’s local coverage by entering your zip code on the Hulu site. If a network’s local stream isn’t available, you can still watch much of the network’s entertainment and news programming on demand. You won’t get local news or other local programs, though. And you won’t get the network’s sports broadcasts, either. The Hulu with Live TV channel list includes a diverse range of entertainment options including shows geared towards kids and teens, repeats of syndicated shows, movies, documentaries and more. Disney’s three kid-centric channels XD, Disney Jr and The Disney Channel lead a strong lineup of networks that appeal to kids of all ages. Sprout focuses on the toddler set while the animations on The Cartoon Network and Boomerang appeal to older kids and (if you stay up late enough) adults. Millennials and Generation Z are the target audience for channels like Oxygen, Freeform, Pop and Viceland. After getting rebranded from ABC Family, the Freeform channel began pivoting towards younger audiences. The Bold Type follows staffers at a Cosmopolitan-like New York fashion mag while Shadowhunters follow New York’s young demon-hunting human-angel hybrids. Pop’s mix of comedies includes rich-fish-out-of-water Schitt’s Creek and fictional late-night show Nightcap. Viceland’s unscripted shows include skateboarder Rick McCrank’s Abandoned and beer master Meg Hill’s Beerland. Oxygen uses a combination of true crime documentaries, mysteries and sisterhood programming to reach a young, multicultural female audience. For a more traditional approach to entertainment, E! and its popular E! News deliver on celebrity gossip and other news from Hollywood. Families can turn to Bravo and Lifetime for a mix of reality TV and scripted entertainment programming. Bravo airs the trials and tribulations of the Real Housewives, cooking competition Top Chef and New York mommy comedy Odd Mom Out. Lifetime’s programming includes Project Runway and Designing Spaces. The rise of original programming means a lot of the must-see TV out there isn’t on the big four broadcast networks – or the premium cable channels. TNT has channeled the CBS approach to programming to create safe, popular shows like The Last Ship, The Librarians and Major Crimes. Meanwhile, USA went the other direction by producing originals Queen of the South and Mr. Robot. Fox’s FX took things even further with American Horror Story and The Strain. Syfy dragged itself out of a Sharknado-sized hole to start producing actual science fiction again. Thanks to shows like The Expanse, Van Helsing and The Magicians the network’s core fans are giving it a second chance. Sometimes you want to turn to the predictable comfort of reruns. Between Friends, Seinfeld and Married… With Children, it’s a wonder TBS has time for original content. Fox’s FXX absorbs shows that don’t cut it on FX along with reruns of Parks and Recreation, Anger Management and The Simpsons. In between local programming, myNetwork TV repeats episodes of The X-Files and various Law & Order spinoffs. Although Hulu’s on-demand catalog of (commercial free) movies offers more choice and flexibility, you can watch live streams of the latest movies showing on FXM, Lifetime Movies and TCM. FXM features modern blockbusters like Taken, Transformers: Age of Extinction and Rise of the Planet of the Apes. Lifetime Movies a top entertainment destination for women with movies like Stalked by My Doctor: The Return, Girlfriend Killer and Daughter for Sale. Turner Classic Movies has a regular rotation of classics from silent films like 1920’s The Closet of Dr. Caligari, the 1950’s Run Silent, Run Deep, the 1970’s Eraserhead and the 1980’s The Princess Bride. Over the past few years, the A&E and TruTV networks evolved their programming lineups from documentaries and fact-based series to a complete reliance on reality TV shows like Duck Dynasty and Hack My Life. If food and kitchen renovation shows are your thing, you can watch Chopped on the Food Network, Kocktails with Khloé on fyi and Flip or Flop on HGTV. But if you’re looking for real reality content, you can catch the documentaries and fact-based programming on National Geographic, Nat Geo Wild, History and the Travel Channel. Hulu’s sports lineup is fairly mainstream compared to sports-centric services like fuboTV, but it makes up for it by having the biggest sports network in the world. ESPN and its secondary channels like ESPN Goal Line, ESPN 2, ESPNews and ESPNU cover all of the major professional and collegiate sports. What ESPN doesn’t cover, you will probably find on Fox Sports, the NBC Sports Network, or the CBS Sports Network. 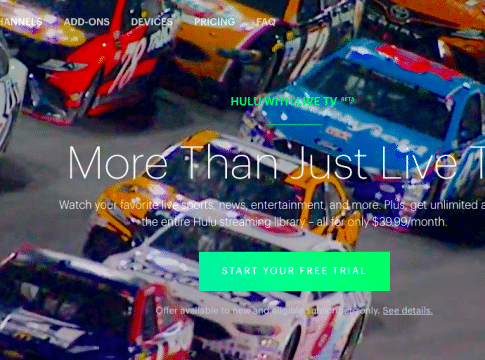 Hulu tries to make it as easy as possible for you to watch football. You can favorite the NFL – and your favorite teams – like you would a TV series so upcoming games appear in your recommended list. The NFL, however, does not make it easy. Even if you get your local stations, the game may get blacked out if the stadium isn’t sold out. On top of that, the NFL will not let Hulu live stream football games to mobile devices. Verizon Wireless cut a deal with the NFL that gives it exclusive access to mobile streaming of the NFL’s games. Hulu with Live TV will assign you to one of the Fox Sports Regional and Fox Sports Regional Plus channels. The major sports leagues are the ones who decide what teams people in different regions get to watch. Neither you or Hulu get any say in the matter so Yankees fans living in Los Angeles will have to settle for the Anaheim Angels. It also means that people living in places like New Mexico without big league teams end up having to watch the Diamondbacks instead of the Rockies. Hulu with Live TV has solid support for mainstream big-league sports, but is not as good as services like fuboTV when it comes to airing niche sports. The handful of Hulu networks that focus on a specific sport or narrow category of sports doesn’t change that. Diehard football fans or graduates of colleges in the SEC or Big Ten conferences will be happy to see the SEC and Big Ten TV networks in the Hulu channel list. If you went to school somewhere else, then you have to hope that one of the national networks have picked up your game. The Golf Channel covers almost all of the major men’s and women’s golf tournaments. Unlike the big networks that only broadcast the last two days of a tournament, the Golf Channel provides hole-by-hole coverage of the Thursday and Friday rounds as well. Winter sports fans can look forward to the Olympic Channel’s coverage of this winter’s Olympic Games from South Korea. For the first time, NBC will air its Olympic coverage live in all US time zones rather than tape-delaying results anybody can find on the web. With Fox News on the right, MSNBC on the left and CNN shoring up the middle you can get a balanced take on breaking national news. CNBC covers the latest news from Wall Street while CNN International conveys the global perspective. If all you need is a quick take on what’s happening now, HLN lets you hear the headlines. The Hulu with Live TV subscription includes access to on-demand content from more than two hundred studios. Besides the standard content from American providers, Hulu has on-demand collections for Spanish-speaking audiences, fans of British programming and anime enthusiasts. Hulu with Live TV is a good alternative to a cable subscription thanks to its lineup of live TV channels and its deep catalog of on-demand content. But which plan should you get? The Limited Commercial plan is your best bet if your main objective is to watch live sports or to keep up-to-date with your favorite shows. You have to watch the ads that appear on the live stream anyway, so paying extra won’t make a difference. The No Commercials plan is best for people who will binge deep on Hulu’s catalog of on-demand programming. Hulu does not have a very diverse mix of ads. Even within the same show, you’re likely to see an ad more than once. There are only so many times you can watch that ad for psoriasis medication. Paying just $4-per-month to make psoriasis ads go away is a pretty good deal.